San Francisco millionaire Andrew Stirling wants to sell his Victorian mansion, but ghostly music, the squeaking of a long-disappeared weathervane, and an angry ghost keep running off potential buyers. After a famous psychic is called in, she informs the Stirlings that their multi-million-dollar renovations to 'update' the home have left its resident ghost extremely agitated. So contractor Mel Turner is engaged to track down and replace some of the original features of the house. But when the beautiful psychic is found stabbed, it appears that someone had a very human motive for murder. Now Mel must use her ghost whispering gift to uncover the secrets of the haunted house on the hill, and her sleuthing skills to catch a killer. 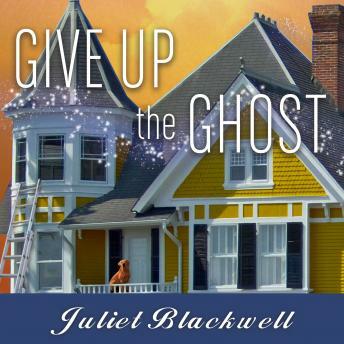 I really enjoyed this book as all of Juliet Blackwells books are all good that I've listened to, the narrator was exceptionally good I'm glad they use the same one.